4Kids have posted the first ten episodes of Yu-Gi-Oh! Duel Monsters unedited and raw on their Youtube account. They also posted the first ten episodes of the same series English dubbed. Well, it’s nice to see 4Kids trying new things. On their website Crunchyroll announced that they will simulcast Gonzo‘s Shangri-La which will premiere April 6th and La Corda D’Oro ~secondo passo~ premieres March 26th to its Anime Membership subscribers. Crunchyroll will also stream the first La Corda D’Oro series March 20th. Nice to hear that biri biri series gets animated! Any news on second season for To aru majutsu no index? biri biri series??? is this like a joke or for real??? That Eden of the East looks awesome, but with the character designs by Chika Umino I can’t help but look at the two protagonists in the trailer and draw a comparison to Morita and Yamada. Especially Morita, since I would also totally expect him to end up like that, and for him to act completely nonchalant. Railgun anime isn’t a joke even though the title makes it sound like one lol; it’s a spin-off manga of index set in the same time frame but from Mikoto’s point of view. Hopefully the Railgun anime is better than the Index anime, just like how the Railgun manga is better than the Index novels. No joke. Railgun anime has already been confirmed at the ending of the last episode of the index anime. They didn’t say anything about scheduling yet but it could be this summer, fall or early next year. As for the 2nd season of index series, although they didn’t say anything about it, I think it’s on the way for sure. If they are not sure about the sequel, there would be no point to introduce brand new character(Laura Stewart) and let her talk about the next adventure for Index and Touma in the last episode of the series. So we are very likely going to have both Index series and Railgun series in the near future. I just can’t wait, to say the least. The fact that the legendary Shirow Masamune is contemplating on a new project is astounding to me. Hopefully we’ll see something on par with GITS here. I was really impressed with Eden of the east!!! really cant wait 4 the premiere! Oh my god. They’re adapting the biri biri manga? Awesome. Looking forward to that. Kind of wished we had more imformation about this Yamato Movie. If it is what I think it is, it should be pretty cool, since they did have a Yamato project in the works (14 years ago) said to take place some 20 years after “Final Yamato” (which came out in 1983 mind you). It’s too bad that Leiji Matsumoto isn’t involved with the new Yamato project, because it’s bound to be terrible without him. If I die before I watch the Railgun manga I’m gonna be pissed. Railgun animated will be awesome!! Maybe. If the art is even close then it may work as “Yamato” rather than what didn’t quite work “Yamato 2520″ or Matsumoto’s own “DaiYamato”. I watched most of “Yamato 2520″ (missing an episode), and while the plot seemed a little too weird…even for Yamato, the space battles were grand, and the homages were perfect. It will depend on if the idea is to just finish what was started those 14 years ago, or setup for a major comeback. If they want a major comeback, than Nishizaki can’t just kill them all at the end (again). I’m hoping for the best, since Yamato was probably the first anime I watched (that I can remember at least) in its dubbed version, “Star Blazers”. Second Season was still the best thing they ever did story wise. “Be Forever Yamato” and “Final Yamato” were extremely pretty animation wise for the early 1980s….and “Final Yamato” is still artistically on par with even 1990s cel animation movies, or even some of the higher end TV animation studios of today (outside of computer work). To Aru Kagaku no Railgun?? That name sounds idiotic. I don’t think using her slightly sarcastic nickname there sounds good at all. While it might have been more ordinary, I think To Aru Kagaku no Misaka would sound better. As for the actual series, I’ll have to take a look. I’m more fond of Misaka than Touma, so this might be an improvement. I thought the concept of having a splinter story from the perspective of a non-main character worked pretty well in .hack//Another Birth (although those books have other flaws). i wish i can the spring line up now so i can choose which 1 to watch. (crossed-fingers) no new mech anime series this spring please!. by the way does any1 know if there is really a second season of tora dora cus i really like it alot. T.H.A.T. has had their spring preview up for a couple weeks. Can read that while waiting for the RC one. 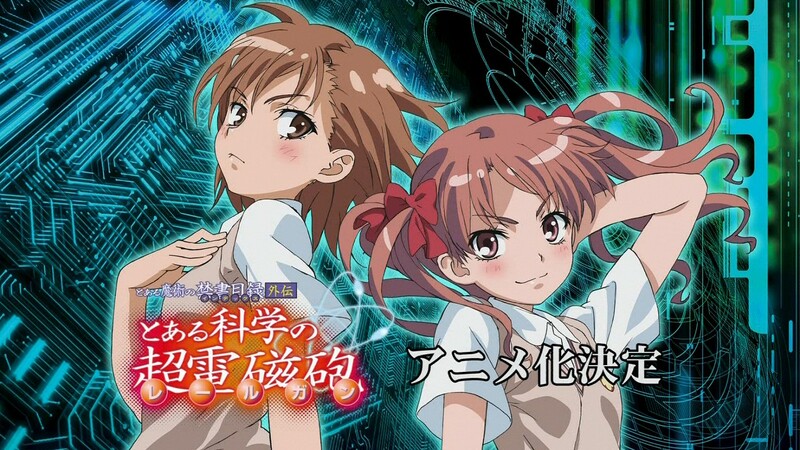 Idiotic or not, とある科学の超電磁砲(To Aru Kagaku no Railgun) was the title which the original novel author Kazuma Kamachi, as storyline superviser, came up with for spin-off manga of Mikoto and Kuroko. Im looking forward to the Index spin off anime.It should be out later this year maybe summer or fall then I guess after that they’ll announce the second season of Index.Railgun would probably be like 12 episode series though since there’s not enough material out yet.Kinda odd they produced the anime that early,I guess its like the intermission before the real series continues. Out of curiosity, but Omni know that the first episode of the new Tsubasa OVA series is out already? Although To Aru Kagaku no Railgun is the best thing since sliced bread, or even bread in general, having biribiri’s anime run in-between To Aru Majutsu no Index’s two seasons has quite a few disadvantages. I can see why this would be a good place to put Railgun (it kind of reminds me of Fumoffu’s placement), as all of the stuff in Railgun happens during the beginning episodes of Index. However, putting this anime right after episode 24 is like putting a C.C.-based spinoff between Code Geass and R2 – it pleases the fanboys immensely (proud Mikotoist right here), but it ultimately would result in one of two things: 1) people would get something of a “we want Haruhi S2 NAO” mentality and build up too much hype over the release of S2, setting the bar impossibly high for the second season, or 2) people would lose interest in the anime altogether.